Posted on August 10, 2017 at 11:13 am. Virtual reality casino players can now use Firefox to access VR casino sites such as Slots Million. 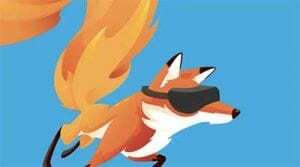 Mozilla has released an updated version of its Firefox Web browser which is compatible with VR, which is sure to make those with the latest cutting edge tech happy. The concept of a VR compatible browser emerged in 2014. Mozilla developers including Vladimir Vukicevic created a browser which could enter VR realms, such as online casinos, which would be ready when the corresponding devices became readily available. Mr Vukicevic left Mozilla for the game engine maker Unity, and Google Chrome won the VR race. Even Microsoft’s browser, Edge, beat Firefox when it made VR compatible in April. But Google and Microsoft are manufacturers of VR devices, promoting compatible browsers. “WebVR is the major platform feature shipping in Firefox 55,” the latest Firefox update reads. It’s great news for Firefox users who have an Oculus Rift headset and want to enter a virtual reality casino from the comfort of their own home. Slots Million designed the first VR casino a few years ago, which remains to be one of the online casino’s biggest attractions. Software developers have jumped on the VR bandwagon too. Net Entertainment offers a range of VR pokies, including Starburst and Gonzo’s Quest. You can also access these at Slots Million. The game experience is incredibly different to standard online gameplay and even the land-based ambience, despite VR aiming to mimic the latter, as the devices provide a 360-degree panoramic view. Slots Million offers users the chance to see what VR is without the headsets too – you can use Firefox to download the software and view the VR casino on your desktop screen. Currently, Chrome only supports Android-powered devices, while Edge requires you to enable developer mode, and Mozilla has had time to review the mistakes of its rival browsers. Mozilla senior vice president of emerging technologies, Sean White, has been evaluating the technology for over two decades. “In the 1990s, unless you had $5 million or $10 million, you couldn’t do it,” he said in a recent interview. But Mr White and Mozilla Chief Executive, Chris Beard, believe augmented reality will overshadow VR. The differences are important as VR worlds are computerised, while AR realms appear more lifelike. “VR will beget AR pretty quickly as a mass-market opportunity,” Mr Beard said. And with casino gambling ahead of the game, we are likely to see some incredible advancements in both the VR and AR casino worlds. Oculus Rift users can go to Slots Million using the Firefox browser and walk around the lifelike casino lobby to view all of the available VR slots. Their games catalogue of VR-enabled games is growing daily, and we are well and truly impressed with the amount of effort and quality put into this still very niche experience. How about regular online casinos? Perhaps you’re not convinced yet by what’s possible with VR hardware or you just want a traditional real money gaming experience – whatever the case, there are a ton of top-rated online casino sites out there that we recommend to all of our readers from multiple countries. If you are from United States, our #1 suggestion is to sign up at Raging Bull Casino. With hundreds of real money slots and table games playable on desktop or mobile devices and regular bonuses and promotions, you don’t need a VR headset to have a high quality online gambling experience just yet.